RENOVATION: space planning, design concept, and finish selections. This client came to me after her initial meetings with her architect. The planned addition to the back of their home - to enlarge the master bath and family room and to provide an area for exercise equipment - was not coming together the way they had envisioned. The rooms as drawn were boxy, small, and clearly inadequate. The challenge was to create a design that was spacious without increasing square footage. This was achieved by creating a multi-purpose space, situating the exercise area within the main bath area. 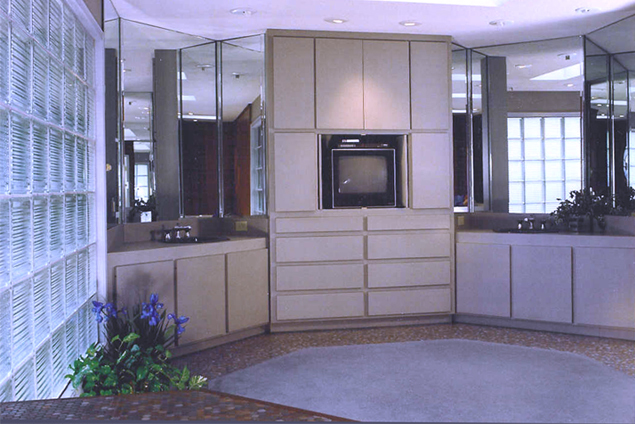 Angles, mirror, and glass block visually expand the space.